What a difference a week makes. After going an underwhelming 1-2 to start off head coach Claude Julien’s second tenure with the team, the Montreal Canadiens are finally seeing some traction in the standings. Granted, the second-place Ottawa Senators still hold enough games in hand to make up the six-point difference between the two teams. However, at 6-2 under Julien after stringing together five straight wins, the Canadiens have turned a corner, and it couldn’t have come at a better time. This is actually the team’s longest winning streak since they won eight straight as part of that infamous 13-1-1 start. That doesn’t seem especially noteworthy, as teams rarely put together five-game winning streaks. However, consider the fact that, following that 13-1-1 start, the team’s longest winning streak up to this recent one? It was just three games. That happened just once. What’s maybe more of an indictment of the team’s mediocrity is how, excluding that three-game streak, they had won two games in a row only three other times. So, you can see why there’s renewed optimism in Montreal among the team’s fanbase. Sure, the first four wins could have gone either way. However, with Carey Price regaining his swagger (.949 save percentage in the seven games under Julien), there’s a real belief his level of play is sustainable… and that maybe Michel Therrien was the problem all along. That isn’t to suggest Price played badly on purpose and consciously torpedoed any shot of Therrien turning things around behind the bench. It’s more of an indication that, when your team is regularly giving up so many high-quality chances to score, any goalie would struggle. Of course, there were signs Price wasn’t playing his best either, but, when your system requires your goalie to play lights-out all the time for it to work, maybe you need a reboot. And that’s what hiring Julien has done. Since he took over, the Habs have a healthy 51.2% edge in shot attempts (score-adjusted Corsi, via figures compiled from hockeystats.ca). 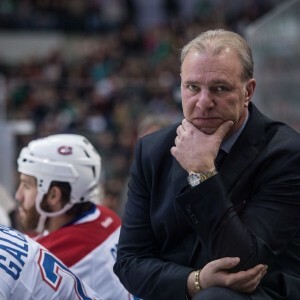 Admittedly, the Habs have a 52.7% edge on the season in that same stats category, meaning Therrien’s system wasn’t exactly a possession black hole. However, when you’re not giving up the puck at your first opportunity only to chase it again and then settle for whatever outside shot you can muster, it can make a world of difference. As Julien’s former team, the Boston Bruins, is leading the charge with 55.9%, the realistic hope is the Habs can do even better and control even more of the play moving forward. In such an instance, the Canadiens shouldn’t be afraid of anyone come the playoffs… at least not for the first few rounds. There’s no denying the relative lack of strength of the Atlantic Division. So, should the Habs stay on top and play the wild-card New York Rangers out of the Metropolitan, as is the likeliest scenario? In spite of their higher point total, as Saturday’s 4-1 victory evidenced the Habs match up well against them. On the other hand, should they fall out of the division lead and face the Boston Bruins or Ottawa Senators? It’s hard to imagine the Habs being heavy underdogs in any of those two scenarios, which bodes well for them, seeing as the surviving team between those two would face the Canadiens in the second round. Come the third, things would no doubt get tougher, but, once you’re in the final four, you have a legitimate shot. You’re legitimate contenders, in other words. Obviously, the Habs shouldn’t count their chickens before they’re hatched, but they’ve at least done a good job lining up their ducks in a row. 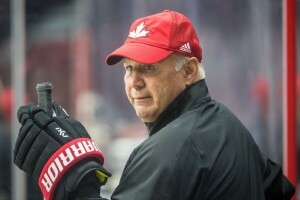 Get a top head coach behind the bench? Check. 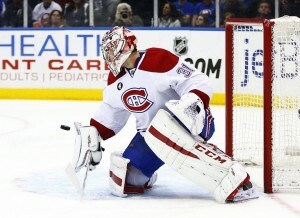 Get Carey Price back on track? Check. Start winning again? Check. An underwhelming trade deadline notwithstanding, the Habs are still a (marginally) better team on paper now than at this time last week. Since they weren’t that different then from the team that started off the season so well and were seen as a threat, there’s no good reason why they can’t regain some semblance of that magic from early on. Forget paper. In practice (and game action), it’s all coming to fruition. Many might not see the Habs as threats now, but that too can play to their advantage down the stretch, which is looking like it might last a while longer.